Chemistry is just applied physics… or so a physicist would tell you. And autonomous vehicles are just a collection of applied sensors – if you’re a sensor manufacturer. That bit of unorthodox wisdom sprang unbidden while I was pondering the product line of Cepton, a San Jose–based company that makes LiDAR sensors for self-driving cars. All those sensors have to come from somewhere, and some of them come from a one-story building on North First Street. Cepton specializes in LiDAR, the laser-based equivalent of radar. The basic technology has been around for decades, and it is used all the time for surveying, meteorology, and navigation. But now, it’s also being strapped to cars as part of a “sensor suite” to help said vehicles avoid anything that isn’t a road. LiDAR is good at range-finding, but not much else. That’s why carmakers generally pair it with cameras and radar to form a more complete picture of the vehicle’s surroundings. Think of a low-resolution black/white digital 3D camera, and you’ve got a good picture of LiDAR’s capabilities. LiDAR works by emitting a laser beam – thus making it an active sensor, not a passive one like a camera – and waiting for that beam to bounce off of a distant object and return. The time of flight tells the LiDAR sensor how far away the object is. But laser beams are very narrow, and they don’t scatter – that’s kind of the point – so a single LiDAR pulse can sense only one very small object directly ahead. It might be able to detect a dime at 50 paces, but not a tall building slightly to one side. To be useful, LiDAR sensors have to scan. And that turns out to be a differentiator among LiDAR manufacturers. Most LiDAR sensors are attached to a motor that spins them around, and, once the laser emissions are synchronized with the motor’s motion, you can tell where the laser was pointing and paste together an overall image of the world ahead. The LiDAR’s field of view depends entirely on how much you move it around. Other manufacturers use mirrors or MEMS to bend the beam or project it. Cepton has its own patented technique that it calls MMT: micro-motion technology. Cepton’s CEO Jun Pei doesn’t willingly share too many technical details of how MMT works, except to say that it’s a bit like a speaker cone in a loudspeaker. 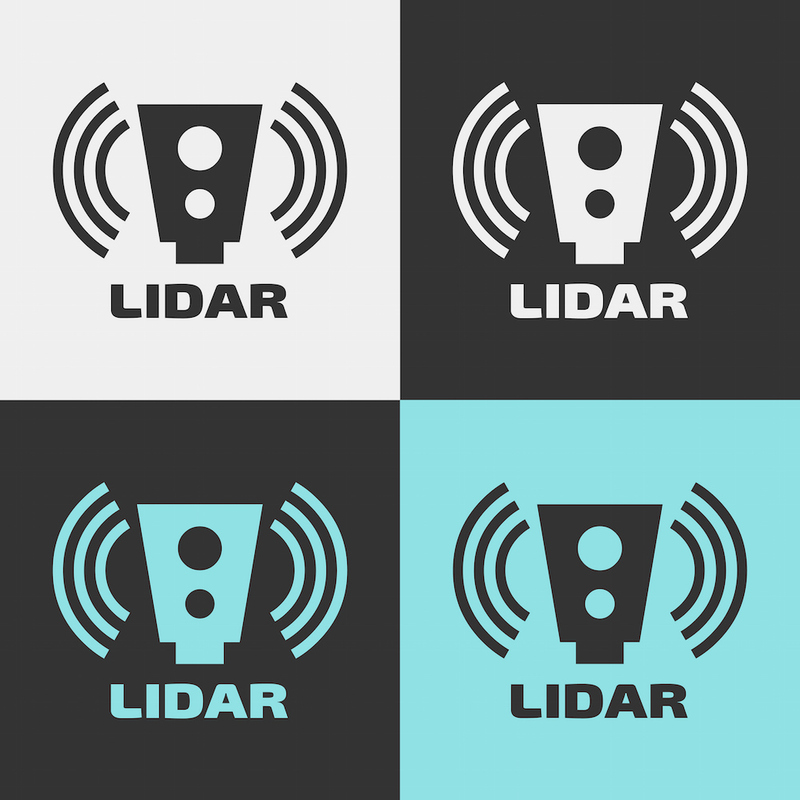 Yes, the LiDAR array moves, but not with mirrors and not with motors. Cepton’s version avoids the inevitable light loss through mirrors, while also eliminating any mechanical wear. It’s a frictionless system (he says) that’s reliable, cheap, and easy to manufacture. The entire LiDAR sensor, including the laser emitter, the photodetector array, the mystery motion system, and the support electronics, all fit in a 2-inch cube. You supply 12VDC and an Ethernet connection, and the box provides your range detection. At first glance, LiDAR detectors appear to have terrible resolution, at least compared to the camera in your phone. Figure on about an order of magnitude fewer pixels (technically, voxels) versus a 1080p camera image. LiDAR also can’t see color, although it can detect differences in reflectivity. This last characteristic is quite useful for vehicles, since painted road stripes are a lot more reflective than asphalt, and street signs are shinier than squirrels. 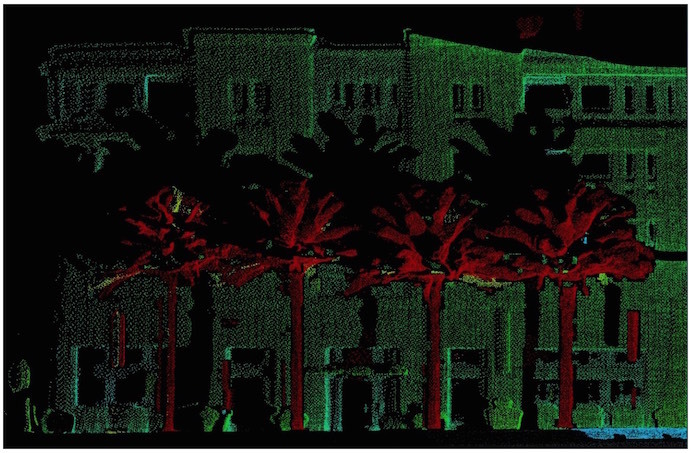 Even with its comparatively low resolution, LiDAR can easily pick out pedestrians, lampposts, vegetation, and small objects with remarkable fidelity. Cepton’s module correlates the laser emitter’s motion with the return time of the reflected signal to produce a “point cloud” that it transfers in real time via Ethernet. It also compensates for the motion of the car, as well as for potential motion of the objects it’s detecting. After that, you’re on your own. Cepton doesn’t provide collision-avoidance software, navigation systems, or any such midlevel functions. It’s simply the eyes, not the brains, of the vehicle. How you incorporate the data is up to you. Ideally, a car gets four LiDAR modules: two in the front and two in the back. This gives a complete view of the road ahead and behind the vehicle. But even one forward-facing LiDAR detector is better than nothing. Because the modules are small, and because they need a clear line of sight forward (or backward), they’re tempting to integrate into headlamp and taillamp assemblies, making them more or less invisible to the casual observer. After all, there aren’t many other places on a car that are transparent to laser light. Hiding them in the head/taillights avoids poking ugly holes in odd places in the car’s body, which automakers appreciate. Headlamp integration is so convenient that Japan’s largest headlight manufacturer, Koito Automotive, has started integrating a version of Cepton’s LiDAR module directly into its LED headlamp assemblies. The LiDAR essentially disappears in amongst the LEDs, and the automakers who buy it don’t have to work out how to accommodate the sensor into the design of their car. It’s just a headlight… with an Ethernet interface. Cepton thinks it’s got a fix for this, too. Many LiDAR manufacturers use indium gallium arsenide lasers, which emit light at around 1550 nm. Laser light at this frequency is considered “eye safe” at reasonable power levels. Unfortunately, it’s also absorbed by many of the objects automotive LiDAR is supposed to detect, so sensor vendors play a game between wavelength and power levels to get the range and resolution they want. Cepton strongly believes in silicon lasers, which work at 905 nm. Silicon lasers are cheaper to manufacturer, but their radiation isn’t as friendly to mammalian retinas. To compensate, Cepton keeps its power low and its detector arrays sensitive. The result, says CEO Pei, is equal safety with better range and lower manufacturing costs. The market for LiDAR sensors goes beyond just cars, although that’s quite enough market opportunity for now, thanks very much. City streetlights could use LiDAR sensors, says Pei, to aim their lamps at objects below and avoid wasting energy when nothing’s there. Or, they could detect traffic jams and report back over a citywide municipal safety network. Although the idea of omniscient streetlights seems a bit strange for now, enabling automotive safety features gets my full support. If drivers aren’t going to pay attention to what’s ahead, it’s nice to know that at least something in the car can.